It's a little known fact that economists love bees - or at least, the idea of bees. The Royal Economic Society's logo is a honeybee. The Fable Of The Bees, published in 1732, uses honeybees as a metaphor for the economy - and anticipates modern economic concepts such as the division of labour and the "invisible hand" that means "greed is good". And when a future winner of the Nobel Prize in economics, James Meade, was looking for an example of a tricky idea in economic theory, he turned to the honeybee for inspiration. The tricky idea was what economists call a "positive externality" - something good that a free market won't produce enough of, meaning that the government might want to subsidise it. For James Meade, the perfect example of a positive externality was the relationship between apples and bees. Imagine, wrote Meade in 1952, a region containing some orchards and some bee-keeping. If the apple farmers planted more apple trees, the bee-keepers would benefit, because that would mean more honey. But the apple farmers wouldn't enjoy that benefit, that positive externality, and so they wouldn't plant as many apple trees as would be best for everyone. This was, according to Meade, "due simply and solely to the fact that the apple farmer cannot charge the bee-keeper for the bees' food". But there's a problem with his thesis. Apple blossom produces almost no honey. And that's only the first thing James Meade didn't know about bees. To understand Meade's more fundamental error, we need a brief history of humans and honeybees. Once upon a time, there was no bee-keeping - only honey hunting, trying to steal honeycombs from wild bees. We see this depicted in cave paintings. Then, at least 5,000 years ago, the practice was formalised. The Greeks, the Egyptians, and the Romans were all partial to domesticated honey. By the Middle Ages, bee-keepers were using skep hives - they're the classic woven beehives that look like a tapering stack of straw tyres. But the trouble with skep hives is that if you want the honey, you need to get rid of the bees - and bee-keepers would generally poison them with sulphurous smoke, shake them off, scoop out the honey, and worry about building another bee colony in due course. In time, though, people started to worry about this waste and disdain for a creature that not only gives us honey but also pollinates our plants. In the 1830s, a bee-rights movement emerged in the US, with the motto: "Never kill a bee." And, in 1852, the US Patent Office awarded patent number 9300A to clergyman Lorenzo Langstroth for a moveable-frame beehive. The Langstroth hive is a wooden box with an opening at the top and frames that hang down, carefully separated from each other by the magic gap of 8mm (0.3in) "bee space" - any smaller, or larger, and the bees start adding their own inconvenient structures. The queen is at the bottom, confined by a "queen excluder" - a mesh that prevents her entry but permits worker bees through. This keeps her bee larvae out of the honeycombs. The honeycombs are easily pulled out and harvested by a spinning centrifuge that flings out, filters and collects the honey. A marvel of design and efficiency, this new hive allowed the industrialisation of the bee. And it's this industrialisation that James Meade hadn't quite grasped. The honeybee is a thoroughly domesticated animal. With Langstroth hives, bees are portable. Nothing stops farmers coming to some financial arrangement with bee-keepers to locate hives amid their crops. A couple of decades after James Meade's famous example, another economist, Steven Cheung, became curious about it - and he did something we economists perhaps don't do often enough: he called up some real people and asked them what actually happens. He discovered that apple farmers routinely paid bee-keepers for the service of pollinating their crops. For some other crops, the bee-keepers do indeed pay farmers for the right to harvest their nectar, the market Meade said should exist but could not. One example is mint, which doesn't need any help from bees but which produces good honey. So apples and bees aren't a good example of a positive externality, because the interaction does take place in a marketplace. And that marketplace is huge. These days, its centre of gravity is the California almond industry. Almonds occupy almost a million acres (4,000 sq km) of California - and farmers sell about $5bn (£3.9bn) worth per year. Almonds need honeybees - five colonies per hectare (10,000 sq m), rented for about $185 (£144) a colony. Langstroth hives are duly strapped together, loaded on to the back of articulated lorries, 400 hives per truck, and driven to the Californian almond groves each spring, travelling by night while the bees are asleep. The numbers are astonishing: 85% of the two million commercial hives in the US are moved, containing tens of billions of bees. As Bee Wilson describes in The Hive: The Story of the Honeybee and Us, the big US bee-keepers manage 10,000 hives each and from California they may travel up to Washington state's cherry orchards, then east to the sunflowers of North and South Dakota and then on to the pumpkin fields of Pennsylvania or the blueberries of Maine. Meade was quite wrong to imagine beekeeping as some kind of rural idyll. Bees have been almost fully industrialised, and pollination thoroughly commercialised. And that presents a conundrum. 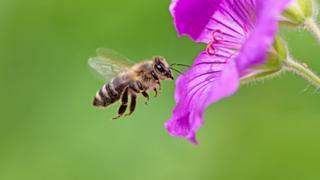 Ecologists are worried about wild bee populations, which are in sharp decline in many parts of the world. Nobody quite knows why. Candidates for blame include parasites, pesticides and the mysterious "colony collapse disorder", where bees simply disappear, leaving a lone queen behind. Domesticated bees face the same pressures, so you might expect to see some simple economics at work - a reduction in the supply of bees increasing the price of pollination services. But that's not what economists see at all. Colony collapse disorder appears to have had minimal effect on any practical metric in the bee market. Farmers are paying much the same for pollination, and the price of new queens - which are specially bred - has hardly budged. It appears that industrial bee-keepers have managed to develop strategies for maintaining the populations on which they rely: breeding and trading queens, splitting colonies and buying booster packs of bees. That is why there is no shortage of honey - or almonds, or apples, or blueberries - not yet, anyway. Should we celebrate economic incentives for preserving at least some populations of bees? Well, maybe. Another perspective is that it's precisely the modern economy's longstanding drive to control and monetise the natural world that caused the problem in the first place. Before monocrop agriculture changed ecosystems, there was no need to lug Langstroth hives around the countryside to pollinate crops - local populations of wild insects did the job free of charge. So if we want an example of a positive externality - something the free market won't provide as much of as society would like - perhaps we should look to land uses that help wild bees and other insects. Wildflower meadows, perhaps - and some governments are indeed subsidising these, just as James Meade would have advised. The author writes the Financial Times's Undercover Economist column. 50 Things That Made the Modern Economyis broadcast on the BBC World Service. You can find more information about the programme's sources and listen to all the episodes onlineor subscribe to the programme podcast.